By the time of Poco's second album, bassist Randy Meisner had left to be replaced by Timothy B. Schmidt. With Schmidt on board, they further refined the distinctive country-rock sound they had debuted with Pickin' Up The Pieces. 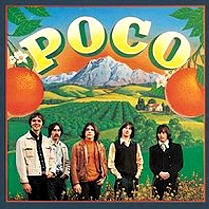 However whilst their first album had entirely consisted of Richie Furay songs, Poco featured only three Furay solo compositions. It also featured one he co-wrote with Schmidt, one band composition, a cover of Dallas Frazier's "Honky Tonk Downstairs", and one written (and sung) by lead guitarist Jim Messina. This song ("You Better Think Twice") has endured as one of the band's best-known numbers, and was indeed the highlight of the album. The other notable song was the closing medley, which took "Nobody's Fool"(from the first album) and stretched it out into an eighteen-minute jam, showing off the instrumental talents of all members (pedal steel guitarist Rusty Young in particular getting to shine). Despite its merits, the album failed to get far on the charts, stalling at #58. Probably one of the best Country rock albums of the era. thanx for sharing this gem! Awesome band at the time. If you're gunshy about checking out new 60's bands this 9is one that won't hurt., I understand as I'm in my 60s and just don't have the time for bad bands. The first 3 albums are decent , IMHO. Second is (the orange one) the best tho.